The deadline for discounted hotel reservations has been extended to September 1, 2014. Contacts for additional information are Luba Sofian, Nordic Travel, or Irina Lynden for general information. 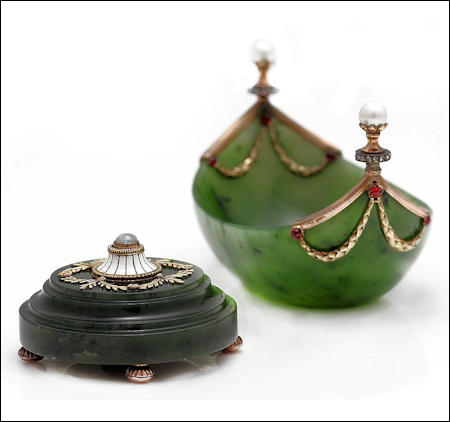 A hundred years ago works by the Russian jeweler Carl Fabergé started to become famous throughout the world. Since then, the interest in his work has been steadily growing. The Third International Fabergé Symposium will take place on October 2-5, 2014, in St. Petersburg, Russia, to commemorate the 142nd Jubilee of the birth of the famous jeweler, and to celebrate the city where he lived and worked. On behalf of the Russian members of the Organizing Committee, we cordially invite you to participate in the Symposium. 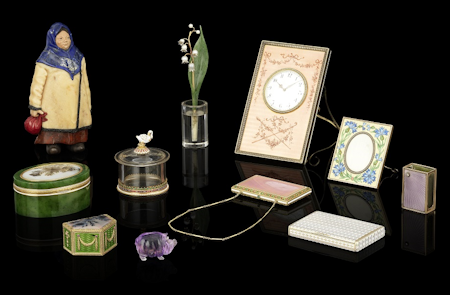 Along with presentations by well-known Fabergé scholars, you will be able to take part in the discussions, see the shop locations of Fabergé’s contemporaries, and most importantly – visit the recently opened “The Link of Times” Museum where many decorative Fabergé objects are shown. An extensive professional and cultural program has been prepared to make your stay interesting, useful, and pleasant. We strongly believe, that in this challenging time of political unrest, communication between people will enforce mutual understanding, build new friendships, and develop additional scholarly research. We are looking forward to welcoming you in St. Petersburg! 1902 – March 9-15 (Old Style). At least nineteen Fabergé eggs given to the Empresses Maria Feodorovna (1847-1928) and Alexandra Feodorovna (1872-1918) by Emperors Alexander III and Nicholas II were loaned to the Exhibition of Objets d’Art and Miniatures in the Baron von Dervis Mansion on the Angliskaia Naberezhnaia (English Embankment), St. Petersburg, Russia. 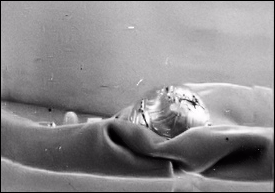 No known exhibition catalog or checklist exist, however, scholars have identified the eggs from photographs published in 1993. 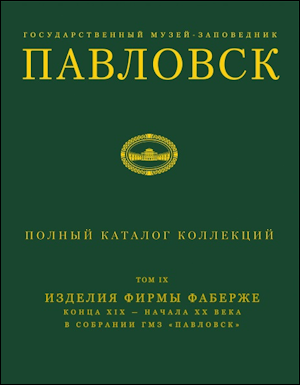 For biographical details of the Baron, his family, and the exhibition see Fabergé, Tatiana, Proler, Lynette G. and Valentin V. Skurlov, The Fabergé Imperial Easter Eggs, 1997, 52-57. The Third Imperial Egg was seen again in public 112 years later – in 2014 – in London. 1917 – Third Imperial Egg survived the Russian Revolution and made it to the west. 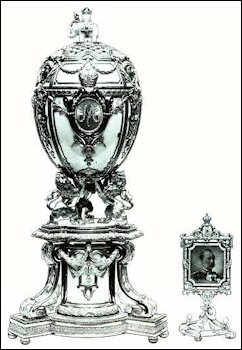 1993 – Ten von Dervis 1902 exhibition photographs in von Habsburg, Géza, and Marina Lopato, Fabergé: Imperial Jeweler, laid the foundation for later research by Fabergé scholars. 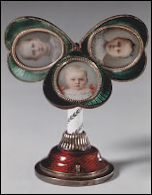 Lowes, Will, and Christel Ludewig McCanless, Fabergé Eggs: A Retrospective Encyclopedia, 2001. 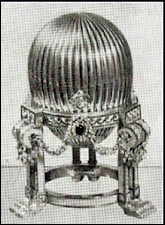 Neither publication included the Third Imperial Egg, since it was believed by scholars the Blue Serpent Egg was the 1887 Egg. Many years later the missing pieces to the puzzle were found. 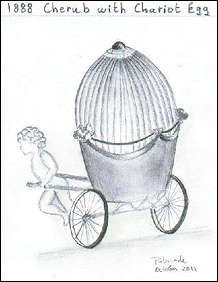 2007 – Anna and Vincent Palmade in “Two Lost Fabergé Imperial Eggs Discovered in an Archival Photograph” (Fabergé Research Newsletter, Eggs) discovered two new Fabergé eggs in the von Dervis photographs – the Cherub with Chariot Egg and the Nécessaire Egg (this image later identified more correctly as the Third Imperial Egg, when the 1964 auction catalog was found in July 2011). 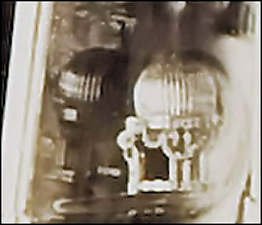 2008 – Kieran McCarthy of Wartski from photographs of the 1949 Wartski exhibition confirmed the identity of the Nécessaire Egg. 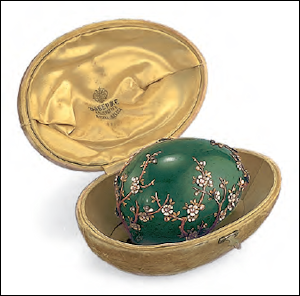 Findings published in Country Life, March 20, 2008, 60-1, “The Missing Nécessaire Egg” by Kieran McCarthy with an excerpt in the Fabergé Research Newsletter, Eggs. 2008 – Research by Annemiek Wintraecken revised the existing egg timeline long used by Fabergé scholars. 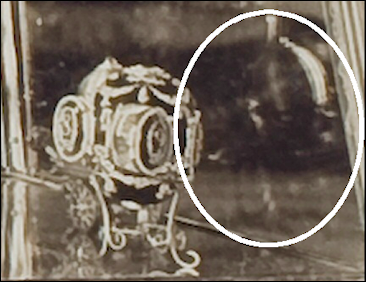 She identified from the photographs found in 1993 the missing Third Imperial Egg, placed it and the 1896 Twelve Monogram Egg in their proper sequence in the new timeline. (Hillwood Estate, Museum, and Gardens officially redated the egg in 2014). “The Fabergé Imperial Easter Eggs: New Discoveries Revise Timeline” by Annemiek Wintraecken was published in the Fabergé Research Newsletter, Eggs. 2011 – After an interview with Kieran McCarthy in the Sunday Telegraph (London), August 13, 2011, “The £20M Imperial Egg Hunt”, the egg hunts goes public. This article posted on the internet and the 2008 revision of the long-standing timeline by Annemiek Wintraecken were significant clues. The detective work by the Palmades from 2007 onward, and the hard work of Kieran McCarthy and the staff at Wartski completed the search for the missing egg. 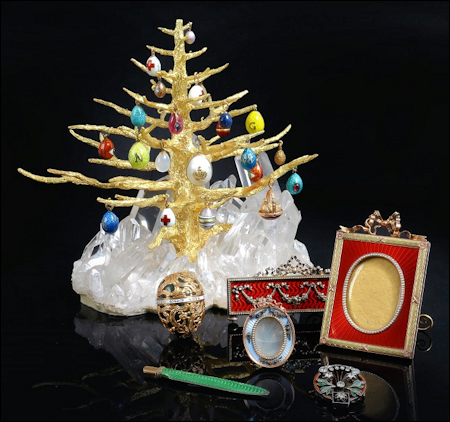 The highlight for Fabergé enthusiasts was the four-day public viewing in 2014 after the egg had already sold to an anonymous collector for an undisclosed price. 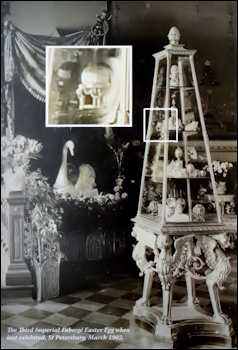 2013 – Annemiek Wintraecken and Christel Ludewig McCanless in “Empress Marie Feodorovna’s Missing Fabergé Easter Eggs” summarized in Royal Russia Annual No. 3 all known details for eight missing eggs. The article is reproduced here for our readers with gracious permission by Paul Gilbert, publisher and editor of the annuals. 1897 Mauve Egg with 3 Miniatures (Possibly the surprise is known) Annemiek Wintraecken with assistance from Elsebeth Welander-Berggren discusses the surprise in the Eggs column of this Fabergé Research Newsletter. 2014 – March 18. 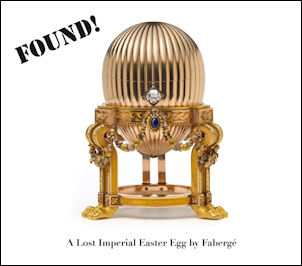 Wartski in a press release announced the 1887 Third Imperial Egg is FOUND! April 14-17. 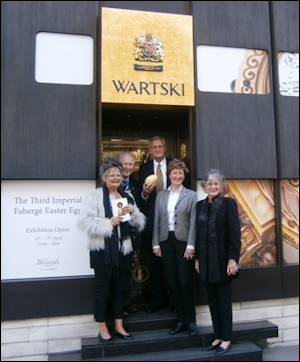 Third Imperial Egg on view at Wartski, 14 Grafton Street, London. Kieran McCarthy reflecting on the event summarized his joy in these words: The exhibition was a stellar success, we had 2270 visitors crowding in to see the Egg over the four days. The world-wide media frenzy both in print, on the internet, radio, and television continued for days – a few selected videos (#1 and #2), and a detailed entry for the Third Imperial Egg in Wikipedia. 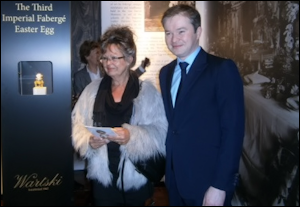 Among the throng of lucky viewers were several Fabergé Research Newsletter readers. It is my pleasure to share a few of their impressions and photos. The rediscovered egg at Wartski is lovely. Tiny, in comparison to later eggs, and relatively restrained: fluted gold with minimal use of gems. My new favorite, without a doubt! A masterpiece of display by the Wartski jeweler and a lesson to others in how to show Fabergé pieces! I went to see the Third Imperial Egg twice to continue my life-long passion of seeing all the known Fabergé Eggs – with this trip from the southern part of America to London the string of seeing 43 of the known 50 eggs is not broken. For the exhibition the Wartski shop had been changed into a little box with blown-up photographs of the von Dervis 1902 exhibition as wall paneling. The Egg was very well lit in a glass show case with a black background in the middle of the room. Very, very nice and a bit like a fairy tale! Annemiek Wintraecken and Kieran McCarthy – All Smiles! The hunt is not over – Six missing surprises for eggs along with seven missing eggs have yet to be found. The research by Fabergé enthusiasts, dealers, and collectors alike continues, and you are invited to join. New research on two surprises – the 1892 Diamond Trellis Egg and the 1897 Mauve Egg – are published in the Eggs column of this Fabergé Research Newsletter. An “eye witness account” of the Fabergé exhibit at the 1900 Paris Exposition Universelle was published in Le Matin, Lundi 14 Mai 1900, Collection Imperiale – Les Oeufs de Pacques de l’imperatrice. It gives a new and interesting insights into the Imperial Easter Eggs displayed. The French reporter was shown all the eggs by “a son of Karl Fabergé”. He reports fourteen (14) eggs were exhibited. A. 1896 frame in a private collection (4½ inches, 11.5 cm.) Red heart with a XII ½ monogram with Mikhail Perhkin’s initials and an assay mark of St. Petersburg before 1896. When opened the leaves contain miniatures of four children and their father. B. 1897 Mauve Egg surprise (3¼ inches, 8.3 cm.) 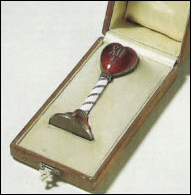 with the date 1897 in diamonds on the strawberry red (also cited as scarlet) guilloché heart, marked K. Fabergé. 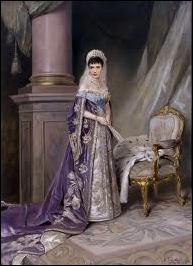 In the Fabergé literature the surprise for the missing Mauve Egg, the Easter gift in 1897 to Maria Feodorovna, has been attributed to a frame (B.) 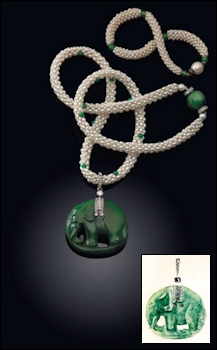 in the former Forbes Magazine Collection, now in the “The Link of Times” Collection. 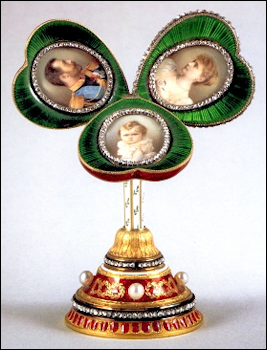 The frame set with the date 1897 in rose-cut diamonds opens as a three-leaf clover with each leaf holding a rose diamond-encircled photograph of Emperor Nicholas II and Alexandra with their first born child, Grand Duchess Olga. In the 1999 Forbes Magazine Collection catalogue raisonné the heart is described as strawberry red guilloché enamel. 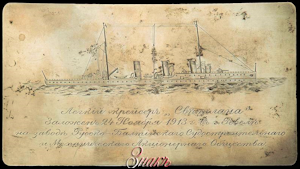 Marina Lopato (1) found the bill of sale in the Russian State Historical Archives in St. Petersburg with these details “an Egg of mauve enamel with three miniatures – 3,500 silver roubles“. In von Habsburg and Lopato (2) the scarlet heart-shaped frame is identified as the surprise for the mauve Egg, and an invoice date of May 17, 1897, is cited. The author of this article wonders if the strawberry red or scarlet color of the frame really blends with the mauve enamel Egg description, and if the suggested surprise frame is indeed part of the lost egg? 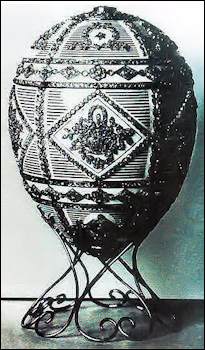 Another observation which is even more puzzling – would Fabergé have repeated a similar design concept in a smaller version for the Mauve Egg presented to the Empress in 1897? My thanks to Elsebeth Berggren for the frame photographs not published in the 1997 catalog, because the miniature needed repairs and was not photographed for the exhibition. 1. Lopato, Marina. “Fresh Light on Fabergé.” Apollo, January 1984, 43-49. 2. von Habsburg, Géza, and Marina Lopato. Fabergé: Imperial Jeweller, 1993, 186. 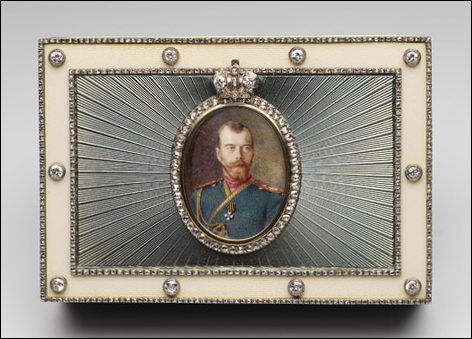 Gregor Lutman of Slovenia in a recent visit to the National Portrait Gallery in London discovered “one of my favorite items ever made by Fabergé – a gem-set presentation box with a miniature portrait of Emperor Nicholas II, in dark green guilloche enamel.” The Great War in Portraits exhibition is on view until June 15, 2015. 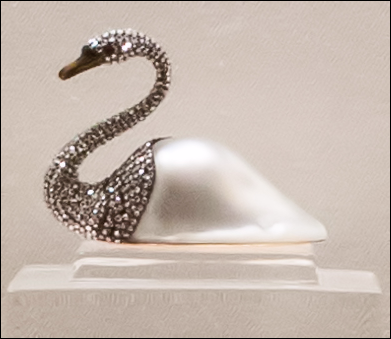 The New York Fabergé dealer, A La Vieille Russie, presented in December 2013 a salute to the Wounded Warrior Project (WWP) with its exhibition, Animals As Art: Wearable and Collectible. The mission of the WWP charity is to foster the most successful, well-adjusted generation of wounded service members in our nation’s history. The North American premiere of Fabergé: A Life of Its Own, a feature-length documentary tracing the story of the House of Fabergé from Carl Fabergé in 1880s St. Petersburg to the present day, won the juried competition for Best Documentary Feature at the Palm Beach International Film Festival. Not available commercially, the film was shown at the Beverly Hills Film Festival and the Newport Beach Film Festival. A La Vieille Russie and Wartski will be exhibiting at Masterpiece London 2014 from June 26 – July 2, 2014. 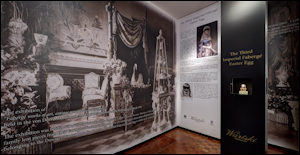 Hillwood Museum, Washington, DC: Fifty-three works, including A Boyar Wedding Feast, the Nuptial Crown, both Fabergé Imperial Eggs, and the Roentgen desk were selected to become part of the Google Art Project. In addition, people can take a virtual tour of the Post Mansion by selecting works of art of interest and clicking to discover more using Google Streetview. Kremlin Museums have updated their website with a walk through the magnificent halls of the Kremlin, and without leaving your seat take a tour via an amazing 360 degree tour. 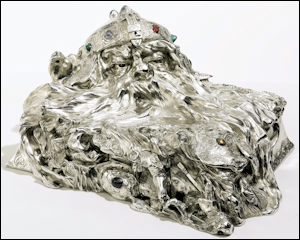 Virginia Museum of Fine Arts, Richmond: A small collection of Fabergé objects, including the Imperial Rock Crystal Easter Egg, will be on display in the European art galleries, while the VMFA’s Fabergé and Russian Decorative Arts collection is on an international tour. 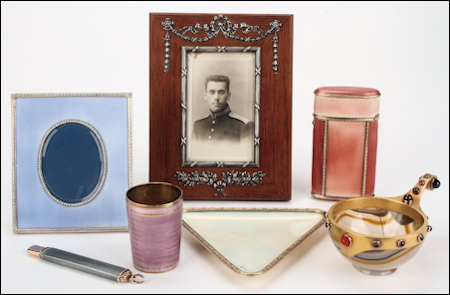 The objects will return to the museum in 2016 for the opening of the newly designed galleries. 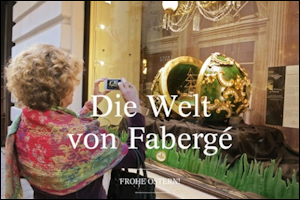 A catalog in German entitled, Die Welt von Fabergé (The World of Fabergé) with essays by Elisabeth Heresch and Tatyana Muntian was published to accompany the recent Vienna exhibition. On loan were 166 objects from the Kremlin State Historical/Cultural Museum and the Fersman Mineralogical Museum in Moscow. A Vienna Bakery – Hofzuckerbäckerei Demel – supported the museum with an exact replica of the Memory of Azov Egg.